For 2018, our president has issued a challenge to guild members. At our January meeting, Sheila asked that everyone raid their stashes and bring a piece of “ugly” fabric to the next meeting. 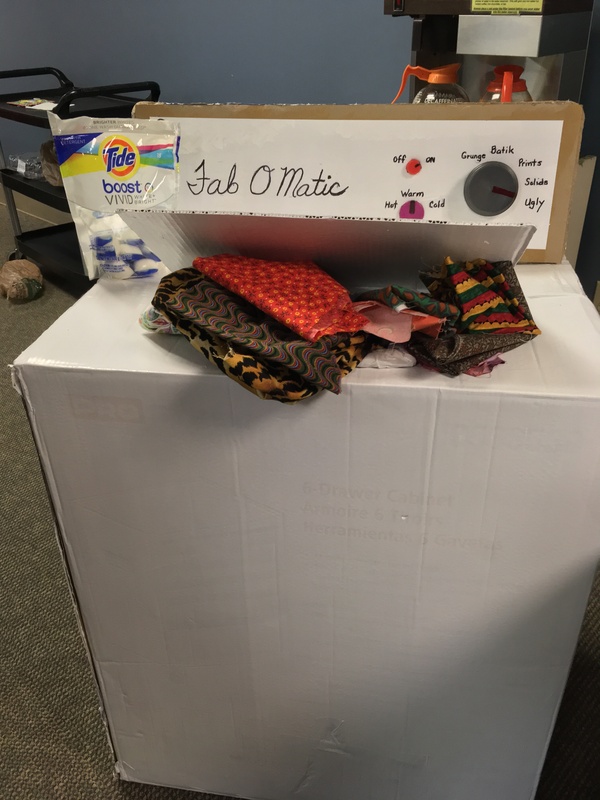 Sheila then showed up in February with a hilarious and creative fab-o-matic washing machine into which everyone placed an ugly fabric. Before we left, everyone had the “pleasure” of reaching in to retrieve an ugly fabric to take home. Check out the looks on those faces in photos of members with their ugly fabrics! Sheila’s challenge was that each of us should use at least 6″ of the ugly fabric in a charity quilt for NALES and return to the September meeting to show how we had incorporated the ugly fabric Into the completed quilt. There will be a drawing in September for a prize from those contributed. How to piece a quilt back – for charity quilts you could pick several fabrics from the guild stash to piece together instead of needing one large piece of fabric.